The Sandia Cooler is back, again! 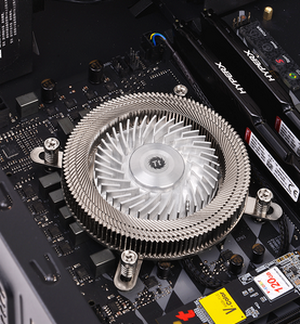 "Thermaltake today released the long-awaited Engine 17 1U Low-Profile CPU Cooler, the latest PC cooling innovation for Intel socket LGA 1150/1151/1155/1156 type CPU. The Engine 17 offers an excellent balance between performance, size and acoustics with the low-profile design (max TDP 35W), along with the most advanced thermal techniques. 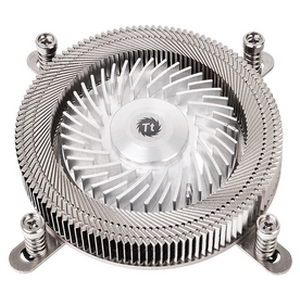 Unlike traditional CPU cooling solutions, the Engine 17 features 17mm height with a compact size 60mm PWM fan, allowing the cooler to be installed into any small form factor applications. 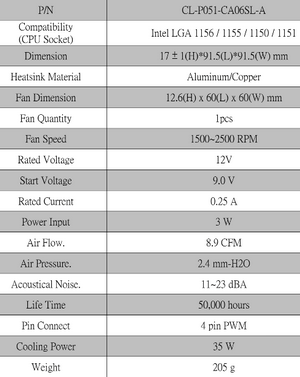 The unique metallic (aluminum alloy) fan structure with copper base guarantees extremely quiet, yet powerful operation. The Engine 17 is the new standard in CPU air cooling technology, and it is exclusive to Thermaltake. 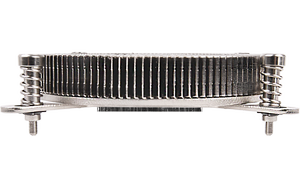 The Engine 17 perfectly solves the co-existing problem of high performance RAM and CPU coolers, achieving the best RAM clearance."